It's been a while since I've read any graphic storytelling that tracked like a traditional comic book. Over the years the superhero conventions haven't captured my attention the way they once did (except in movies, which is more nostalgia for for an old goat like me), replaced first by the works of Neil Gaiman and Allan Moore and then eventually by the broader work taking place in graphic novels. Good vs. Evil stories get kind of old after a while, and instead adventures more grounded in reality satisfied the comic jones. But after seeing a testimonial from writer Junot Diaz my curiosity was piqued. 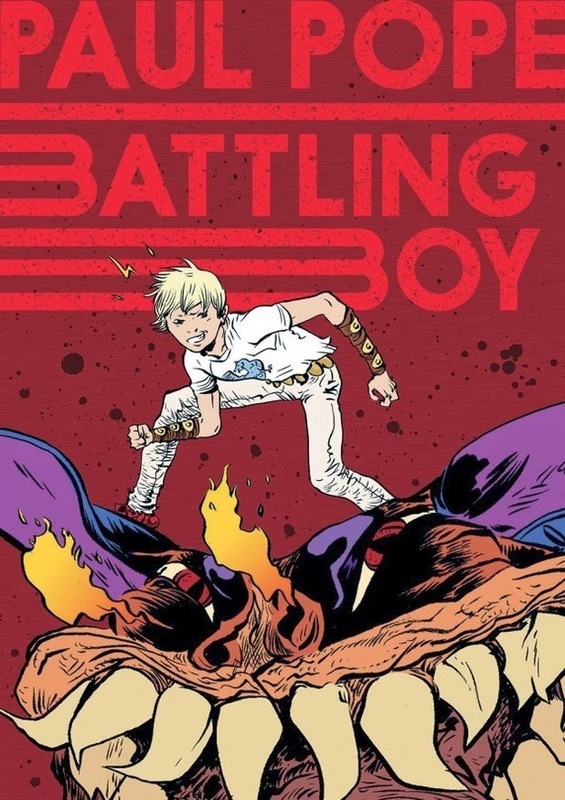 I had a slightly deflating moment when it seemed like Battling Boy was going to turn into Thor Jr., what with his father out saving other parts of the galaxy and holding court in a parallel Asgard, but creator Paul Pope knows why were there and its to see what happens when a boy has to battle a monster for the first time. This is the notion of the superhero origin story brought to its true ur-beginning: first fight ever. Battling Boy arrives knowing he's got a giant car/glass/building-eating monster to deal with but no tools or skills for dealing with it. After a few half-hearted attempts he even calls dad while he's at work to bail him out. Once the monster is dispatched Battling Boy suddenly has to deal with being hailed the hero and savior to Acropolis. He has also drawn the attention of the previously mentioned spiders and the lesser monsters terrorizing the good people. In a very short period of time Pope has built a new universe similar to our own, populated it with an amalgam of superhero types and tropes, and given us a clueless boy as the focal point. But not the only focal point. Haggard West didn't work alone, he had the assistance of his teen daughter Aurora, and she intends to continue in her late father's footsteps. Here's where things get interesting, because it's clear Pope is setting us up for a Battling Girl down the road and the possibility that these two with either become a team or a great pair of bad guy-fighting frenemies. And so many questions unanswered! Where did these night-terror bad guys come from, how long has Acropolis been under siege, and is Battling Boy the first person from his home world to come and try to clean this place up... without success? Stylistically, the parallel with European comics, especially Moebius, cannot be ignored. For the comics geeks out there, if The Mighty Thor and The Airtight Garage managed to have a love child that was raised on Flash Gordon comic strips, it would be Battling Boy. Whether or not that makes any sense, or intrigues, shouldn't matter: Battling Boy is a solid chunk of graphic fun.